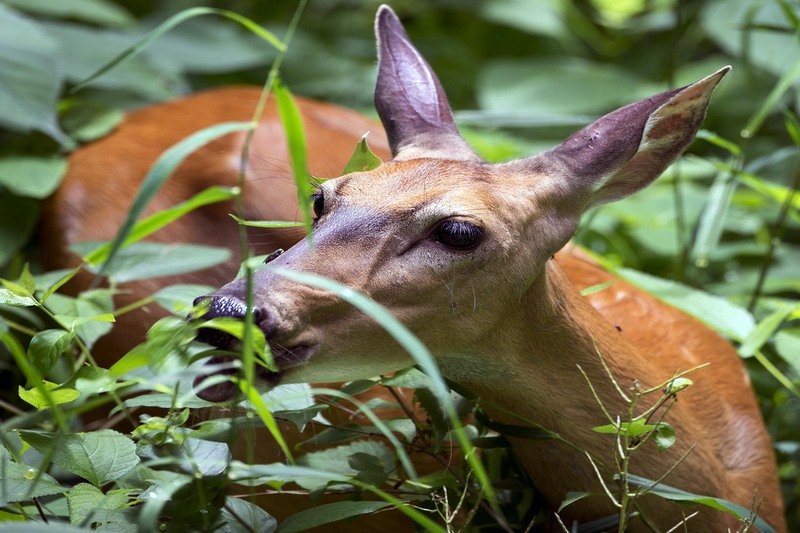 Moving slowly with little sound a White Tailed Deer enjoys a nice buffet of fresh leaves. Thanks and thanks for the feedback as we really appreciate the comments. Hope your week is going well. Nice capture! Great detail and not the typical deer pose. Hi David, yes we really lucky to have this doe let us get so close and just hang out with her while she went about her business finding lunch that day. Thanks and we hope your week is going well. Amazing! How wonderful to have been able to capture this. Hi Sarah, yes we feel lucky that she let us hang out so close. Hope your day has been a fine one and thanks for the comments as we really appreciate the feedback. Thanks Pete, it was special for her to let us hang out so close and feel comfortable. That is quite a catch. Excellent Mike. Wow! You got close! Very sweet capture. Hi and yes we were watching very quietly as this doe got closer and closer to us. IT was very special for her to let us share some time with her. Hi, she was a seer deer but no mushrooms.